Pets offer their amazing ability to capitalize on the human-animal bond and bring comfort to patients while the patient is in a care giving environment. Dogs are non-judgmental and offer their unconditional love and acceptance to patients with no pressure on the patient to do or say anything. Animals used as therapy pets seem to have a positive effect on those individuals who love animals. In many cases the patient’s focus is momentarily diverted from their emotional and physical challenges of a hospital stay to focusing on the dog. Research has shown that when a patient interacts with a dog, the patient may realize a reduction of blood pressure, stress, anxiety, loneliness, depression and fear. Responses may also include increased awareness, communication, and smiles. 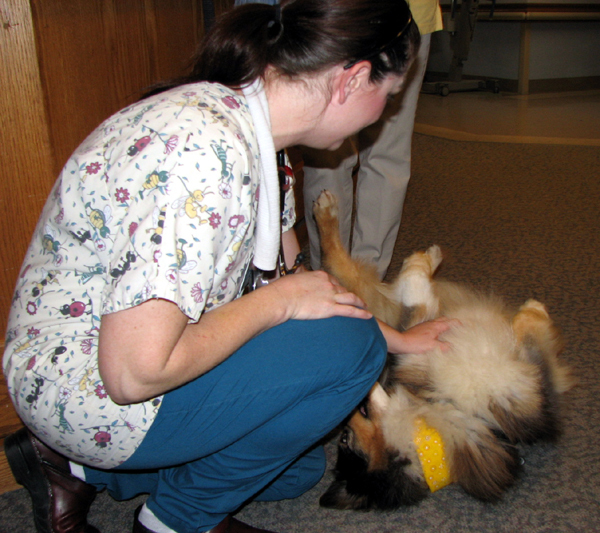 Pet visits offer physical and emotional benefits and may help the healing process along with the patient’s well being. Family members and guests of any hospital patient also benefit from pet visits as their time in the hospital can be stressful as well. 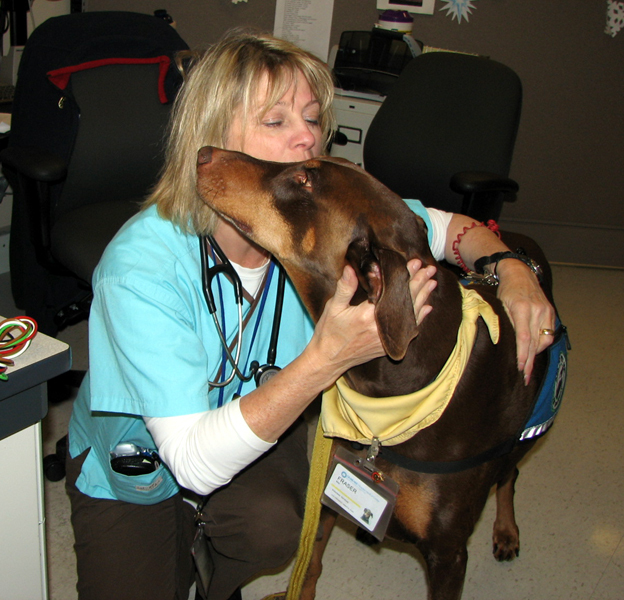 Nurses, doctors and other staff give to everyone else during their busy day at the hospital and also benefit from their interactions with our loving dog volunteers. 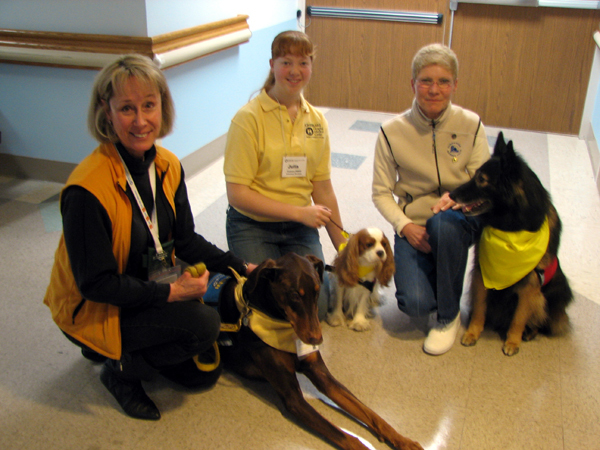 What Exactly Do the Dogs Do at Overlake Hospital? Certified therapy dogs accepted into our program at Overlake offer interested patients, who are not immune suppressed, a pet visit or what is referred to as a “meet and greet.” The handler brings the dog into the patient’s room, right up to the patient’s bed or chair where the patient can enjoy the opportunity to pet, love, hug or just look at one of our amazing volunteer dogs. “NO,” has rarely been an obstacle for me when I want something badly enough. So creating a program at Overlake, helping implement the program and offering to coordinate a therapy pets program truly became a mission of mine. There were a couple of reasons a pet therapy program was not initially met with the greatest of enthusiasm. This lack of enthusiasm was primarily due to concerns regarding infection control and risk management. Understandably, as both issues are high priorities in a hospital environment. 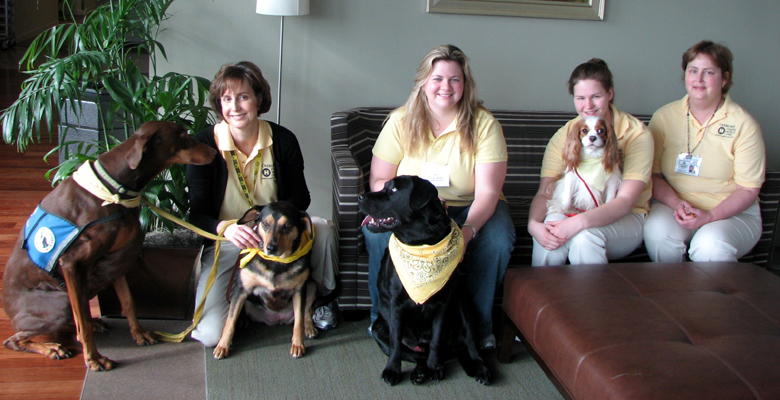 I initially wanted to create a pet therapy program to visit cancer patients. I had personal reasons for wanting to start the program visiting patients battling cancer. And, I wanted to give back to Seattle by volunteering in a pet therapy capacity. If I was given the chance to establish a program visiting cancer patients and prove to hospital staff this program would be beneficial to patients, I would be set up for my next goal. 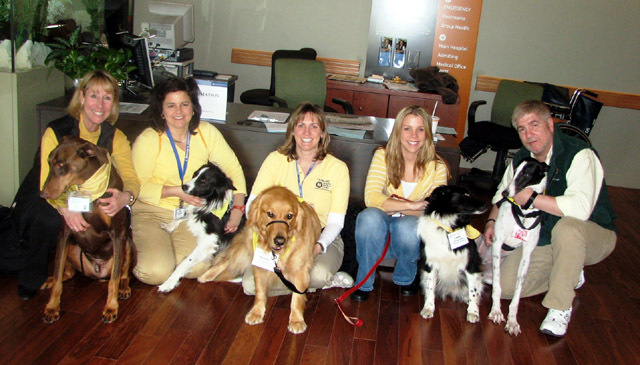 My next goal was to recruit other therapy teams for pet visits and open up the entire hospital for pet therapy visits. In 2004, I was lucky to meet Robert Wohlman, M.D. Dr. Bob got behind this idea and went to bat for me. Dr. Bob, along with a few other amazing supporters, Gail Ratley, R.N., and Carol Betz, who at that time was the volunteer director, helped me carve a path for this amazing program in 2004. After finally hearing a “yes,” the new volunteer director, Kim Smith became an ardent supporter of this new program as Carol retired. Kim went to work with other departments setting up policies, procedure and protocol for this new program. We had many meetings creating and reviewing protocol. Thank YOU again, Dr. Bob, Gail, Carol the volunteer department and other departments who got on board with this new program. Then, in 2005, with the unwavering support of the volunteer department, and most of the staff, our pet visitation program was launched. 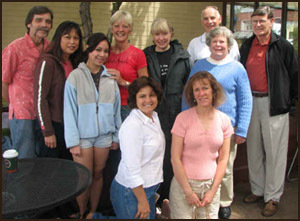 Our first visit was March 14, 2005 with one handler, me, and one dog, my Doberman Pinscher, Fraser. Fraser and I passed the hospital’s 90 day probation period with rave reviews from patients and staff. The units that were authorized for our test run were oncology and rehabilitation. After this preliminary success, I was given the green light to recruit other teams, and along with the volunteer department and staff open up other units for therapy visits. The volunteer department and I are proud to have teams visiting every authorized unit at the hospital. The staff at Overlake has been incredibly supportive of our program over the past couple of years. I continue to be grateful for their support. Our program has grown to include a variety of loving dogs and dedicated owners. Many of our dogs are featured on this site, with more pictures to come. 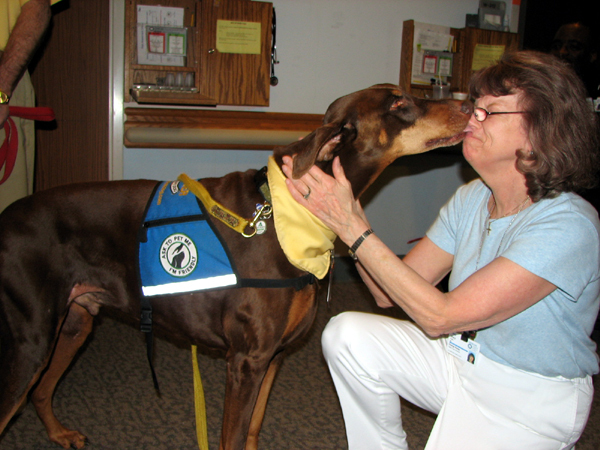 Our volunteer dogs come in all shapes and sizes and bring their gift of unconditional love to patients at Overlake. We are pleased to have contributed over a thousand volunteer hours thus far visiting patients, families and staff at the Hospital. How can a Patient Receive a Pet Visit? The nursing staff also makes the rounds the day of a pet visit on their unit asking patients if they would like a pet visit. Names are put on an authorized visiting list so when the handler volunteering on that unit arrives, the handler can make sure all who want a pet visit get their visit with the dog. We know how important our visits are to some patients as they tell us how excited they have been waiting for our arrival. Very heart warming. Do Teams need any Specific Training for this Program other than their Therapy Certification? Yes, as there is more to visits than just bringing a dog into the hospital. All handlers first must go through volunteer orientation. Volunteer orientation is required of all volunteers at most hospitals around the country. At Overlake, this orientation is usually given by the director of volunteer services. The orientation is very helpful for new volunteers covering a variety of topics such as patient’s bill of rights. Each volunteer is required by law to uphold the confidentiality of patients visited at any hospital. After completing orientation, each handler and dog team goes through specific team training with me prior to going it alone. This is done by shadowing me and one of my therapy dogs. The dogs in training seem to model after my dogs which help train and calm them a bit in this new environment. Handlers must learn hospital protocol and procedure specific to this program. It is not difficult. But, for the safety of the dog, the handler and, of course, the patient handlers must follow specific hospital policy set up for this program. Once training is completed and I sign off on the team, handlers feel quite confidant to go it alone. The total team having learned what is expected through the training, feels like a pro when they begin their visits. Yes, both purebred and mixed breed dogs, from toy breeds to giant breeds. The dog needs to be people friendly, calm, confidant, well mannered, know basic obedience skills, and most important love attention and affection, including hugs from strangers. Dog needs to be quiet and relaxed around crowds. Dog needs to be comfortable around unusual surroundings and unusual sounds. The team must pass a standardized screening test by a licensed evaluator. The dog is evaluated on basic behavior, manners and overall temperament along with demonstrating some basic obedience skills. Obedience includes; walking on a leash without pulling, and of course sit, stay, down, come on leash. We do not want to ask a dog who is not thrilled with closeness from strangers or is uncomfortable in a hospital setting to feel forced to accept love just to comply for the owner. This is not fair to our beloved dogs. Are there specific Handler requirements? Handlers need to be comfortable talking with strangers and patients. 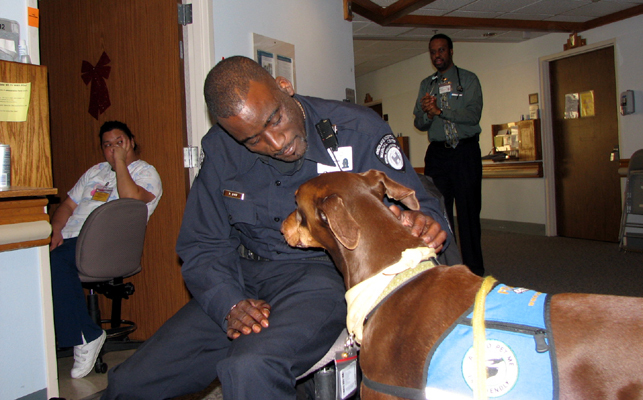 Handlers need to be comfortable around a hospital setting. 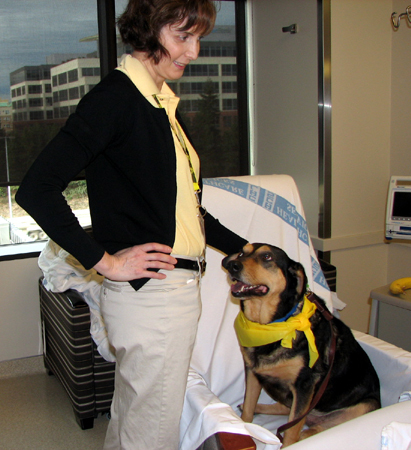 Handlers need to control their dog in the hospital setting and follow protocol. What if I don’t have my own dog but want to become involved with the Pet Therapy program? All family members can be certified with the same family dog for pet visits. Yes. We allow qualified children ages 14 to 17 into our pet visitation program. Where can I get Training and Certification? If you want to learn more about pet therapy I also offer pet therapy seminars year around. If you are not sure if your team is qualified for pet therapy, please contact me to set up a private appointment for an evaluation. If you think your dog may qualify but want group training, I also offer a pet therapy training class for any dog over 6 months of age. I also offer private training. Go to the pet therapy section of this website for location of classes, fees and information on workshops, seminars, training and evaluations. We have had the opportunity to gain recognition from our local TV news stations including KIRO and KOMO, radio, along with various print media including, The Seattle Times and King County Journal. How can my Dog and I Become Involved at Overlake? If you would like to learn more about our program please contact me at AskDiane@SpokesDog.com to explore this very rewarding volunteer experience.